Image caption The driver had no alcohol in his system, police said. 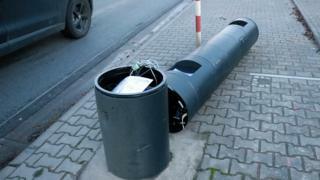 Police say a tractor driver who went on a rampage in Germany knocked down six speed cameras, causing hundreds of thousands of euros worth of damage. Police say the 63-year-old intentionally aimed at the cameras in the small town of Gernsheim in the Hesse region on Monday night and Tuesday morning. The cameras were several miles apart in the town on the Rhine river, 50km (30 miles) from Frankfurt. The man's motive is not yet clear. A police spokesman said the driver had no alcohol in his system. However it is unlikely that he had been issued with a ticket when previously driving the tractor, which could only drive at six km/h (4mph). Police said the man would be charged with criminal damage.